Talk about your group photo. The National Library of Medicine marks its 175th anniversary this year. 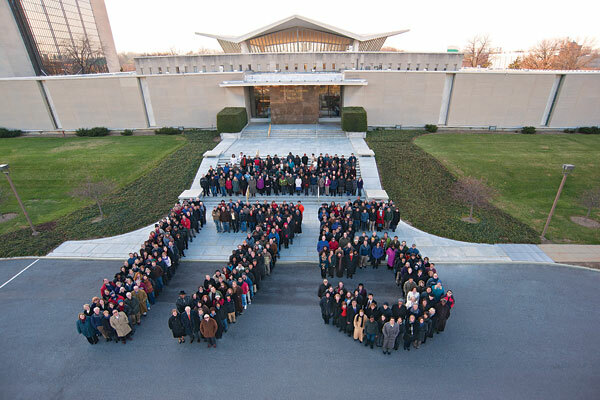 As part of the celebration, hundreds of workers recently formed the number 175 and posed for a commemorative photo. “It was a wonderful event, and nice to see how many people came out for it,” said NLM Director Donald A.B. Lindberg, MD. Assembling the staff and creating the photo was a feat that involved logistics, art, aerial bravery, and the ability to stand still for 10 minutes. “I’ve done photo shoots before, but never one this big,” said Andrew Pettiti, the graphic artist charged with designing the footprint of the vast “175” on the pavement in front of the Library. To do so, he surveyed that area and carefully calculated the dimensions, to ensure the numbers would look crisp when photographed. He also calculated how many people would be needed to form the figures. His design was 48 feet wide and 36 feet long, and required 360 people standing shoulder-to-shoulder. Enthusiasm was so high, and turnout was so large, people filled the 175 as well as the steps leading to the Library. “This is a great way to get the staff together to celebrate the Library’s anniversary,” said technical information specialist Elisabeth Unger, as she waited for instructions for the photo shoot. Those instructions came in the form of color-coded choreography created by the NLM Office of Administrative and Management Analysis Services, which handled most of the logistics. The numbers were drawn in chalk on the driveway in front of the Library. As people showed up, they were handed a colored post-it note indicating in which number they were to stand. Felicia Torchiano, a support services specialist, herded the crowd into place and encouraged people to stand closer together by repeatedly shouting “love thy neighbor, love thy neighbor.” Once in position, the crowd was instructed to stand still for 10 minutes. The Library, part of the National Institutes of Health, got aerial support for the photo from the NIH fire department. Photographer Jessica Marcotte was raised high above the crowd thanks to a fire truck tower ladder. From roundup to wrap-up the whole process took about 30 minutes. The picture, taken in December, will be featured on a special anniversary Web site highlighting the Library’s evolution and information innovation. NLM started in 1836 as a few books in the Office of the Surgeon General of the Army. Today NLM is the world’s largest medical library and the developer of electronic information services, delivering trillions of bytes of data daily to millions of people around the world. “It’s great to be part of a grand event. We’re part of history,” said Aaron Navarro, Assistant Director for Program Development in the NLM Lister Hill National Center for Biomedical Communications. January 26, 2011 in Events, Featured Articles.